In case you missed the memo, the time for turtlenecks is NOW. You may still think they’re the domain of stuffy Latin professors tucked away in liberal arts schools somewhere in New Hampshire, but we’re here to tell you “Nullo modo homo” (no way, man). 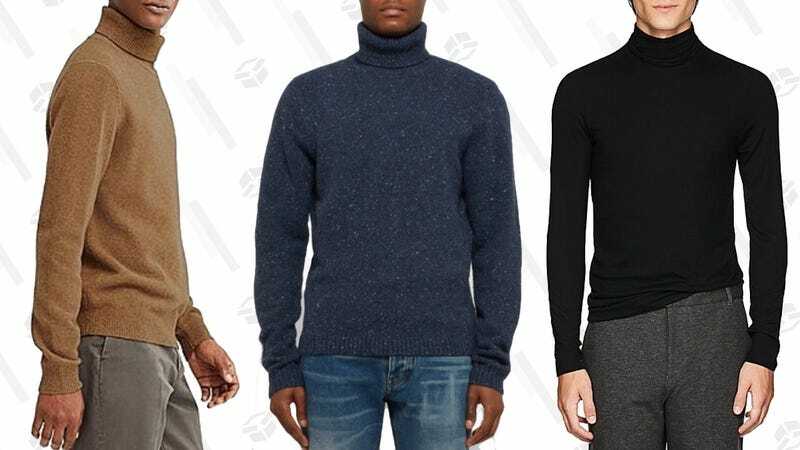 Turtlenecks are for every guy, including you! Read on and get inspired, because there’s really no excuse for coming out the other side this winter without one, or, y’know, four or five receiving tenure in your cold weather wardrobe. If you think turtlenecks are tricky, think again. Turtlenecks quite effortlessly sub in for all your other top options. Think of this cold-weather staple as a crewneck that goes above and beyond. Literally. When paired with a suit in place of the standard shirt and tie, a turtleneck gives a rakish, devil-may-care vibe. With cords and a denim jacket, you’re casual but classy. And as a knit, a turtleneck is scientifically 1000x more comfortable than your standard shirt-and-tie option. Are you looking to get a pop of color with your turtleneck? At $30 each, you might as well just buy every color—though green is a clear favorite of ours. It feels festive enough for holiday parties, but can be played down just as easily with black jeans and a navy puffer vest all winter long. A Fair Isle turtleneck is both visually and physically the coziest of all patterned sweaters. It’s science. And opting for grey means you can wear it all winter long—no ugly Christmas sweater vibes here. Great for pretty much any winter photo op where you want to look like you may have just stepped off your skis. Traditional cable-knit details add visual interest and bulk, while a mock-neck makes this style more modern than the classic roll-neck (i.e., it’s great for entry-level turtleneck wearers). Oh, and the best part? This bad boy is made with 80% recycled merino wool, making it way more sustainable than your average new purchase. It’s hard to say what’s softer: the plush look of this sweater or the yummy camel color. A neutral piece through and through, this turtleneck is guaranteed to become a winter wardrobe workhorse. The shade would be fab paired with olive chinos and a charcoal shacket, or add dark denim and a plaid flannel over it for a more grunge vibe. We’re all for upgraded classics, and this mélange turtleneck is just that. You can never go wrong with navy, and a subtle texture makes this chunkier turtleneck even better. Wear this one to the office with grey wool trousers, keep things casual with jeans and sneakers, or add a little color for this season’s holiday parties with cranberry chinos. An unexpected color for such a dreary season, this vibrant citrus turtleneck can be toned down for daily wear by pairing it with more sober hues like khaki and fatigue green. You also can’t miss with a bolder match...say, light gray windowpane trouser or a brown plaid sportcoat. If you want a base layer turtleneck, look no further: this is the turtleneck for you. A slim-fit, thin-knit turtleneck made of micromodal so soft you’ll want to hibernate from November to March in it. Perfect for layering under a lighter jacket to then wear under a big winter coat.